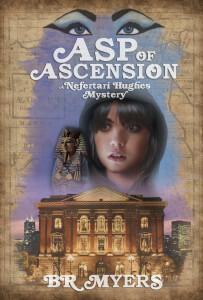 I have been participating in the Cursed and Curated Blog Tour for Asp of Ascension author BR Myers. If you missed part one, you can check out my review of Myers’ YA mystery! Welcome now to part two, my Q&A on writing processes, literary influences and more, with BR Myers! What is your typical writing process (or processes)? Usually it begins with one scene I can’t stop thinking about. I build the story around that moment; it might be the ending, the middle, or the inciting incident, but it’s the starting point of the process for me. Then I do a quick outline and make myself sit in the chair and knock out the story in small increments. I make sure I write a certain word count each time. I don’t think I’d ever get anything on paper if I didn’t set goals. What do you find to be the most difficult aspects of writing? Writing the first word. It’s like trying to start a gas powered lawn mower—it takes a few painful and frustrating attempts to get started, but once the engine kicks in all you have to do is move forward. How have your influences or literary inspirations impacted your writing? My definition of success has had the greatest impact. I’ve been writing for eight years and in the beginning the most exciting aspect was sharing my stories. Once I decided to become published I opened a can of worms and spent the next six years getting rejected. I almost turned my back on writing and then I remembered why I had started in the first place—to share my stories. Around that time I heard Margaret Atwood on CBC radio discussing a new online site called Wattpad. It enabled anyone with a cell phone, anywhere in the world, access to all the stories posted on the site…for free. I posted a few short stories and a YA novel I was working on. The response was immediate and positive. The success on Wattpad helped me establish a solid readership following and was instrumental in my first book deal—only four months after I joined. When writing the character of Terry, did you have any go-to inspirations in terms of cultivating a strong, independent heroine? If so, who or what were they? She’s a regular teenager. I don’t think it’s such a stretch to write about an independent and strong girl—they’re everywhere! I wanted Terry to be likeable, of course, but she needed to be relatable in the sense that she was dealing with some heavy issues of loss and her decisions were affected by that. I wanted to show she was independent, but vulnerable too. I think most teenagers feel torn between those two identities as it’s a time in your life when you begin to understand that you have to go out in the world and start taking on responsibilities, but there’s a part of you that doesn’t want to grow up—doesn’t want anything to change. What is the one book you would, without hesitation, recommend to a young reader? To an older reader? Only one? Yikes! It depends on who the person is and what they like to read. Horror, history, science fiction, contemporary… Okay, I’ll give you my pick for the universal recommendation for any age: Harry Potter and the Prisoner of Azkaban. It’s my favourite of the series. Who are some authors in the children’s and YA genres that you grew up reading and admiring? I absolutely devoured anything by Lois Duncan, Stephen King and Ray Bradbury. Who are some authors that you are currently enjoying (in children’s and/or YA)? I have recently discovered Banana Yoshimoto. She’s a YA writer from Japan and her style reminds me very much of Haruki Murakami. She uses simple yet poetic prose that makes the everyday aspects of life intriguing. I especially love when writer can make the process of making a cup of coffee seem interesting, Alice Munro does that better than anyone. Thank you for hosting my on your blog, Michelle. I appreciate the support. Your insightful questions really made me dig deep. And to you as well! It has been a pleasure taking part in this blog tour! Thanks to BR Myers and to Fierce Ink Press!